"While I never met my grandparents, I know them through the values they taught my father and aunt, and those included concern for all humankind," said Harold Kohn, a professor emeritus at the University of North Carolina. "It is my great privilege to honor their lives through this gift. Through the Kohn Professorship, their spirit will be memorialized to help those living on the margins of society." "I am deeply grateful to Hal and Carol Kohn for their generosity in establishing the Hermann and Amalie Kohn Professorship in Social Policy and Social Justice at the Ford School," said Michael Barr, the Joan and Sanford Weill Dean of Public Policy. "Their memory will be kept alive by the impact this gift will have on research and policy engagement benefitting disadvantaged families." "Poverty Solutions is deeply committed to building knowledge about the challenges millions of Americans face and taking concrete action that helps alleviate poverty," said H. Luke Shaefer, director of Poverty Solutions. "This gift recognizes that the work we do makes an impact, and it will allow us to leverage our research further to boost economic opportunity, expand educational attainment, and improve health for struggling Americans." A professor of chemistry, Kohn was taken by the word "solution" in the name, Poverty Solutions. "In my line of work, a solution brings different chemicals together thereby allowing their transformation," he said. "That is what Poverty Solutions does, too. Combining intellect, research and compassion to bring about change." 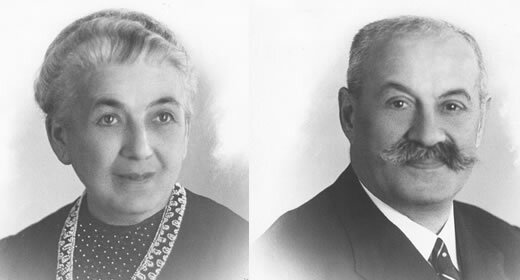 Read the biography of Hermann and Amalie Kohn.